Post subject: A flower for my love. I'd like to start off by saying "Hi" to everyone here. I normally hang out at Blenderartists but with it being down I have to find a new place for advice. I'm still relatively new to the 3d world and have no training besides a few tutorials I've used. I made this as a gift for my wife for Valentines day. I tried to go for a more cartoony style flower. Any advice or critiquing would be much appreciated. Hehe, really happy and cute image. Can be slightly brighter. 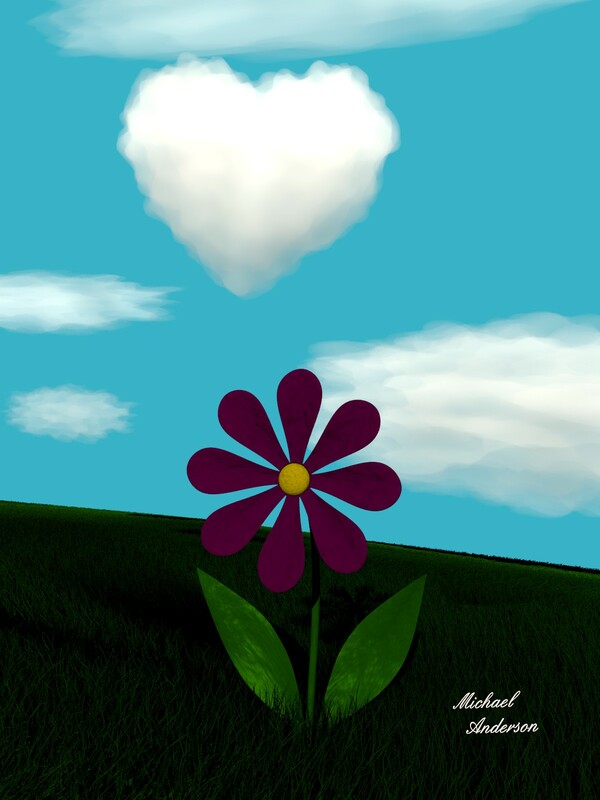 To make the flower look more realistic you have to add some variations in its form. You flower now is too symmetric which looks CG. Also try to learn about sub surface scattering shader and experiment with it to achieve translucency in leaves and petals. I agree with the brighter. I love the heart cloud though! But you have one more vote for brighter colors Good luck! Nice picture. I like the flower like it is on the picture. Very sweet. Please post updates! But maybe it will more beautiful if you make the scene brighter.